When we received Danielle’s pre-order for Partake, there was message from her. The last line read: “I’d love Partake to be part of my big day!” At this point, Partake hadn’t even been packaged yet. The Partake release date was planned for a week before her wedding date and was tentative at best. This was Danielle’s wedding! Of course Partake had to be there but, would it be possible? Danielle and Izzy’s love story began three and a half years ago with what they coin “The Cheesestick Night”. They had been friends through Danielle’s sister for years before but on this faithful night, their special connection unexpectedly took a new and exciting turn. Izzy was visiting Danielle’s sister and Danielle popped over to surprise them. Once there, she found Izzy standing at the top of a staircase in the pitch dark illuminated only by her cell phone screen. Looking up at Izzy, Danielle was mesmerized and watched Izzy as she chomped on a stick of cheese. It just so happens that at that very moment, Izzy was texting Danielle to come over…and the rest is history. 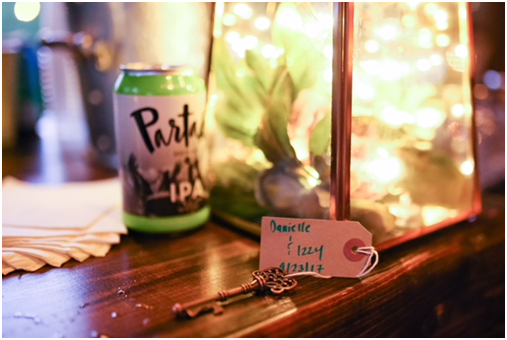 Danielle and Izzy’s vision for their wedding was to be a casual affair with all their closest friends and family. They chose The Lodge in Tolland, CT as their location which boasts beautiful vaulted ceilings, a huge wraparound porch, and a pond outside. Green, copper, white and lavender speckled the space in the decor and flowers. The extravagance in this wedding revolved around the love of and for the couple. Saying their vows to each other was a highlight for this couple. Unknowingly and catching herself off guard, Izzy’s first words to Danielle were: “Are you even listening to me?” This received a good laugh from friends and family aware that Danielle occasionally needs a check in. Both women said very heartfelt things with Danielle always adding a punch of humour. If Danielle and Izzy had to sum up the latter part of the evening, it could be done in three words – epic dance party! The people at this wedding loved and wanted to dance. Izzy’s father sprinted down the porch when he heard the opening notes of Paradise By the Dashboard Light by Meatloaf, his one requested song of the night. He and 20 guests sang the lyrics to each other and danced like there was no tomorrow. 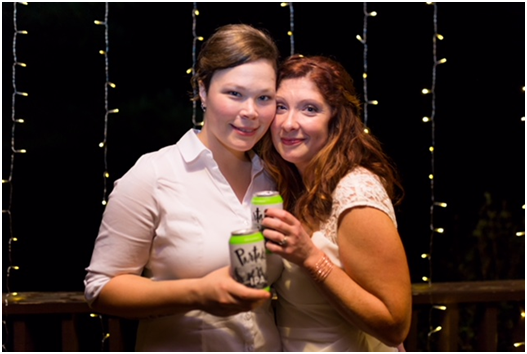 Thank you for including us at your wedding, Danielle and Izzy! 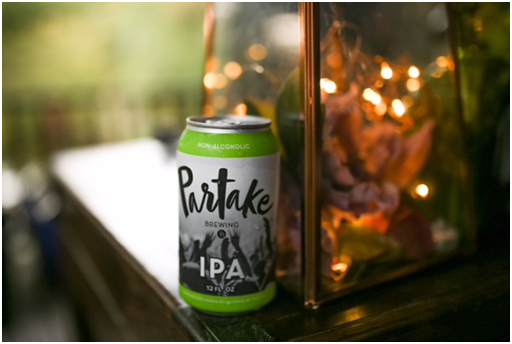 Why Partake At Your Wedding? 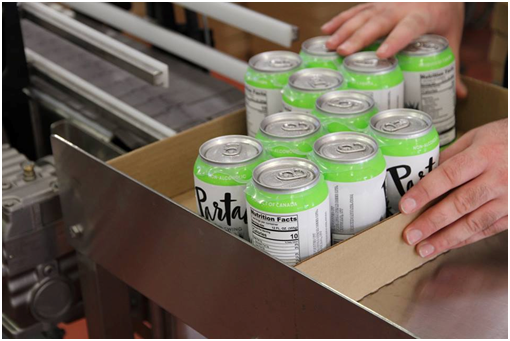 Give your guests who may not want to drink alcohol, who are the designated driver or who may just want a break from what can be an alcohol-driven evening with some non-alcoholic options like Partake beer. 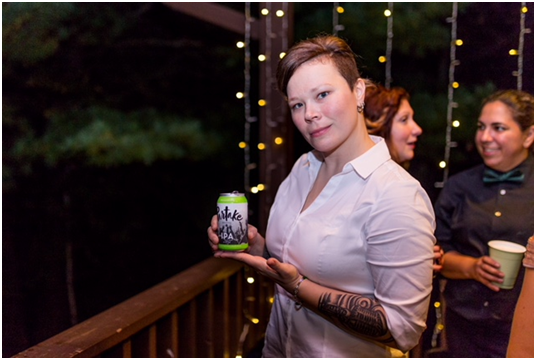 If you would like Partake to partake at your wedding, please find us online at premiumnearbeer.com for more information and ordering.